The next chapter of the Sam and Fuzzy saga begins today! Over the next few weeks, all you long-time readers in the audience will learn exactly where and how all the different parts of our new epic fit in with everything that has come before them. And I'm sure that after today's comic, many of you will already have some pretty good guesses... especially if you've been paying really close attention during the last couple of years of strips. But Volume 5 isn't purely for the die-hards. Much like the previous volume, our new story can also be read and enjoyed by folks who haven't had even the slightest bit of prior Sam and Fuzzy exposure. Even if you have never read a single comic I have ever drawn, you can read Volume 5. Just start with today's strip and go nuts. Yes, today is one of those fabled "jumping on" points for new readers -- something that happens pretty rarely around these epic, continuity-driven parts! 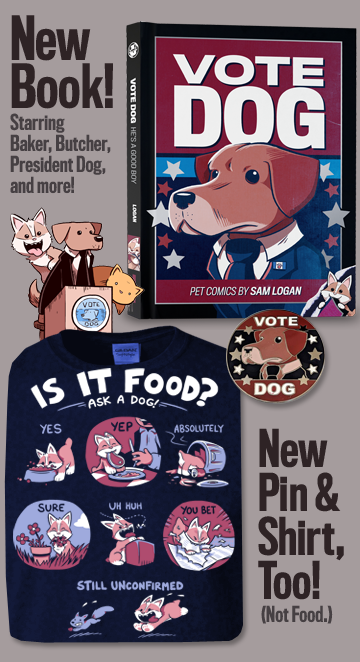 So friends, I ask you... if there is anyone out there that you think needs to be reading this comic, please let them know: now is the time to take a crack at it. There will never be an easier time to start reading Sam and Fuzzy than right now! Ever! That's a wrap for "Crisis of Conscience"! I hope you all enjoyed this little team-up more than Conscience Cat did. It was a lot of fun to put together! Today is also the first installment of our new Q and A feature! I thought I'd kick things off with a few similarly-themed questions about the technical side of things, and save some of your questions about the comic's story and characters for next week. After all, a whole new volume of Sam and Fuzzy starts on Monday, and I wouldn't want to accidentally spoil any of it! A lot of my friends have long since switched over to tablets and cintiqs, but I still do pretty much all of my drawing on dead trees with pencils and pens. It's just how I roll! Prehistorically. That said, even a Luddite like myself can't resist using the computer for certain otherwise-tedious tasks, like drawing panel borders, filling in large black spaces, or adding dialogue lettering and speech balloons. I also occasionally use the computer to invert certain parts of the line-work, so that the lines become white-on-black instead of black-on-white -- the white lines on the ground in the second-to-last panel of today's comic are one example of this. And yes... every once in awhile, I use the computer to fix mistakes, or to duplicate any visual elements that need to be repeated exactly in multiple panels. I am only human! A typical page of Sam and Fuzzy art looks like this before I have at it with a computer. I pencil my art with pretty much whatever happens to be lying around, and ink it entirely with a Staedtler MARS Graphic 3000 brush pen. Once upon a time I also used micron tech pens for finer details, but these days I'm comfortable enough with a brush that it isn't really necessary. Keeping control of line weight when you're using a brush is really hard! It requires a degree of finesse that can only really be acquired through practice and years of muscle memory. I'm a living example of that. Let's take a moment to look back at the first Sam and Fuzzy strip I ever inked with a brush. Great. Now let's never look at it again. Practice aside, it also helps to try out a few different kinds of brushes to see what you're comfortable with, because each one has its own feel. With the Staedtlers I use, the "brush" is actually a piece of shaped rubber that is a lot firmer and more stubborn than most other brush pens. (Or actual brushes!) As a result, you don't have to be as dainty with it -- you can use it a lot more forcefully than others without your lines getting too thick or too messy. But on the flip side, some artists might not like how hard you have to press with it to get a reasonably broad line. If you've got your own question you'd like added to the pile, just email it to me with "Q & A" in the subject line. I'll keep picking a few to answer every week! Well, there seems to be solid support for the Q & A feature proposed in Monday's newspost! And by "solid support," I mean "my inbox is overflowing with approximately three lifetime's worth of questions to answer." But that's great! 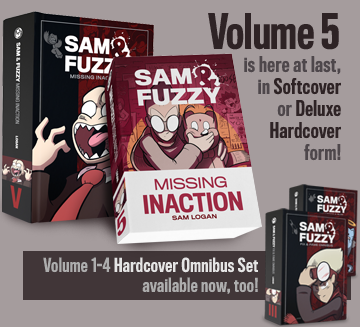 It's been really fun to see what aspects of Sam and Fuzzy you are all interested in. If you have a question of your own that you would like to add to the pile, just drop me an email with "Q & A" in the subject line. I know can't answer them all, but I can pick out some of my favourites to answer in this Friday's newspost, and then try to answer a couple more every Friday thereafter! I can, so I will. And who knows... maybe my answers will be so incredibly tedious that no one will want to ask me anything ever again!